The Colorado River slices through some of the most beautiful scenery of the continent. Dams have impounded the river in several places, creating lakes of incredible beauty and variety. These lakes are the gems of the Colorado. In this case, it is the settings of the lakes that are truly precious. Take a trip through deep time to better understand the craftsmanship that has created these glorious settings. Some folks refer to a body of water as a gem. Perhaps. But, water is often a rather mundane jewel. When Halcyon is sitting at anchor, and we look over the side at the water, it is always the same - water. Oh, sometimes it's clear, sometimes muddy - sometimes it's salt, and sometimes fresh. Occasionally, it even sparkles like a gem. But - it is always water. Now don't get us wrong - we love water. Perhaps, being desert people, more than most. A lake, a bay, a cove, an ocean certainly can be exquisite. What creates the gasps of wonder - the awestruck obligation of silent appreciation - is the setting. And that is geologic! - lofty mountains towering to high glaciated summits; sheer canyon walls leaping hundreds of feet from meandering, flooded streambeds; arching mounds of sand rippling to the skyline. Sometimes, the geologic setting is enhanced by botany - a dark forest of feathery pine trees, the shadowy wonder of a verdant oak forest, the exclamation mark of a barrel cactus punctuating a bare rock cliff … The setting creates the glory. The Canyon Lakes of the Colorado River are perhaps the most precious settings of any fresh water lake on the continent - certainly, the most dramatic in the Southwest. Here, in the droughtlands, water itself rises to the term, gem. 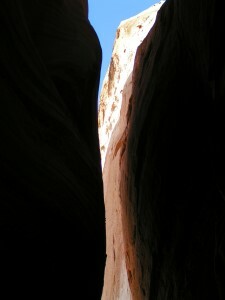 The sparkling munificence of water sheltered in deep alcoves below soaring dark walls of sculptured rock is a treasure. 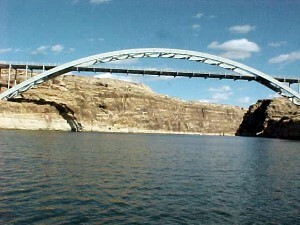 We have cruised three of these desert lakes - Powell, Mead, and Mohave. Such prosaic names Washington bureaucrats give to artificial lakes. Major Powell, who traversed these canyons back when the Colorado River ran free, had imagination. Listen to the names he, and other early explorers, used to describe the canyons: Flaming Gorge, Desolation, Stillwater, Glen, Iceberg, Music Temple, Hidden, Secret, Forbidding, Cathedral, Last Chance … Now, those are names that evoke the true soul of place. Each lake is utterly unique - nowhere is there a remote counterpart. Their exclusive nature is determined by rock - and deep time - trapped in lithology. 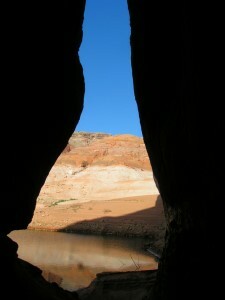 Lake Powell nestles within the Colorado Plateau, a landscape of haunting beauty. This vast region, centered on the Grand Canyon, is an area of plateaus, mesas, and deep canyons, with brilliant colors and artistically sculpted rocks - arguably, the most beautiful canyonland on the planet. The terrain is a lithic layer-cake. One massive flat bed atop another. This is a rarity, since Earth is a tumultuous place. For 600 million years the Colorado Plateau has been stable, a remarkable span of quiescent time on a continent racked by the tectonic convulsions of crustal plates in almost constant collision. In contrast, surrounding geologic provinces have suffered severe deformation, with rocks twisted, folded, and thrust. The Rocky Mountains are thrust skyward to the north and east of the Plateau, and the fractured crust of the Basin and Range lies to the west and south. The unique nature of the undisturbed nature of the Colorado Plateau demands explanation, and this requires a search back into the shrouded mists of deep time. In Earth's youth, it was a rambunctious child. Meteors impacted, crust seethed in red-hot convulsions, and all was molten. There is no record of those eons, since earth history is recorded in rock. If anything cooled enough to form rock back then, the lithic record was soon stirred back into the cauldron and melted. Finally, as with any rowdy past, things had to settle down and, with slow cooling, a thin skim of crust formed. The crust was composed of the lightest-weight stuff of the meteor-agglomerated Earth, like the creamy froth on a latté. This stuff was mostly silica, and light-colored. Below the crust, heavy, black, iron-rich magmas continued to churn. Impacting stuff from space continued to puncture the early light crust. Pressures from within Earth's molten interior heaved against the surface skim, fragmenting the new crust into plates. Lateral pressure shoved the plates against each other. The edges chafed and crumpled. Through time, all the light-weight light-colored stuff rose to the surface of the cauldron. But there wasn't enough to cover Earth's surface. The black iron magmas cooled slowly between the fragments of silica crust and filled the spaces. But the black rock was heavy, and sunk lower into the molten stuff below, whereas the light silica plates floated higher. Eventually, the steaming atmosphere cooled sufficiently for water to precipitate as rain. The torrents poured off the higher silica plates. Floods filled the low basins underlain by black rock - Earth had oceans and became the Blue Planet. The plates of silica crust are Earth's continents. They floated high on the molten black magmas below. They still do. Why, it's a shorter distance to molten rock below your feet, straight down, than I used to commute to work. The hot convecting currents down there press against the base of the crust, both the black-rock plates under the oceans and the light plates of the continents, fragmenting the crust and shoving around the pieces. These plates are pushed around, under, over, and against each other. Plate boundaries are often active - the locus of earthquakes and volcanoes. Where plates run into each other, mountains are thrust upward - like the Appalachians. Where they have pulled apart, trenches form - like the Connecticut and Mississippi River Valleys. Forces on this scale, geologists call Tectonic. And the result, we term Plate Tectonics. Now we need an analogy to comprehend the enormity of deep time. Let's compare all of earth's history, almost 6 billion years geologists believe, to one 24-hour day, beginning at midnight. When dawn comes to our earth day, the crust is still seething. The first cooling crust to leave a record below the Colorado Plateau didn't freeze to rock until almost 4:00 in the afternoon - no lithologic history in this area until afternoon!! These oldest rocks are deeply buried beneath the rocks of Lake Powell, and are only found in cores from deep wells or in the bottom of the Grand Canyon. They are smashed rocks, recrystallized by the enormous metamorphosing pressure of plate collisions. By 8:00 in the evening, these rocks had been twisted upward into lofty mountains (at least once) and beveled off into a plain of hard rock. 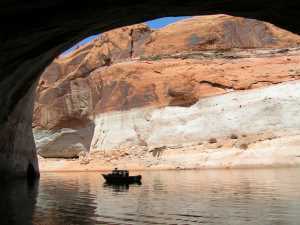 The oldest rocks exposed at the land surface are at the north end of Lake Powell. They were formed about 10:00, shortly after life forms evolved hard shells and could be clearly detected as fossils. These are limestones deposited in warm, shallow, equatorial seas. They are laden with fossils - of clams and corals, and other more primitive life forms. We call that time of early life the Paleozoic. Paleo = old. Zoo = life. The time of old life. On our clock of deep time, the day is almost over - almost over! 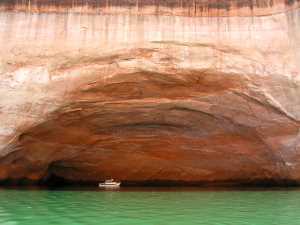 - before the first rocks found at Lake Powell were formed at about 10 p.m - before life forms higher than microbes and jellyfish evolved! Seas washed across the region, depositing the Paleozoic limestone that forms the gray walls of the Colorado River above Hite. The sea remained, with minor withdrawals and advances, until about 11 p.m. At that time, the African and South American plates, welded together, collided with North America. The continents buckled upward, crumpling the Appalachian and Ouachita Mountains to heights challenging the Himalaya of today. 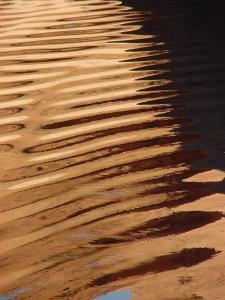 The Ancestral Rockies warped upward just to the east of our Lake Powell region, forcing the sea to withdraw. This was the dawn of the Mesozoic. Meso = middle. Zoo = life. The age of the middle life forms. Reptiles dominated the land, seas, and air. Rivers coursed and meandered down the flanks of the Ancestral Rockies and spread erosional detritus over the Powell region. The iron-rich Mesozoic sediments are striking. They are rust-red, from oxidizing in the warm tropical Mesozoic air. The sea was nearby, and at times of higher sea level, our region was covered by stinking, red, tidal, mud flats. During drought times, wind blew over those sediments, winnowing out sand and piling sand dunes over a huge area. 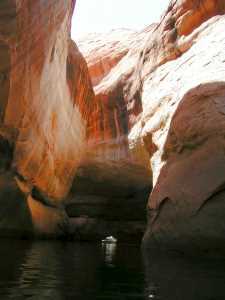 The arcing cross-beds, characteristic of dune sand, mark many of the canyon walls of Lake Powell. Eruptions from volcanic mountain ranges to the west buried vast regions beneath ashy debris that mingled with the red mud. Dinosaurs strolled the Mesozoic mudflats and sand dunes, leaving giant tracks in sediment that later turned to rock. 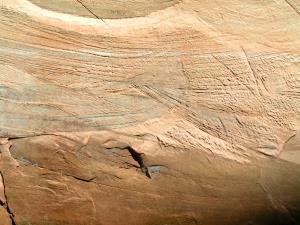 These are the rocks of Glen Canyon - the rocks that confine Lake Powell are the true Jurassic Park. They were deposited from 11 p.m. until 11:58. Only two minutes to go in our countdown to the present and the dinosaurs exit as powdered ash from center stage. Their extinction probably marks the impact of a massive meteor striking Earth in the present-day Yucatan and enveloping the entire planet in life-choking sun-blocking clouds of dust. Most life choked, cremated, or froze. It was the flaming, drowning, frigid end of the Mesozoic. At the dawn of the Cenozoic (Cenos = recent), or Recent Life Era, the Colorado Plateau had been stable and unwrinkled for 600 million years - more than two hours on our deep time clock. Great events had happened on the Plateau borders - Ancestral Rockies had lifted to the east at the end of the Paleozoic. During the last half of the Mesozoic, the shifting plates of Earth's crust converged on the western margin of our continent. Fragments of continents, once islands far over the western horizon of the Pacific, converged on North America. They collided and accreted, creating mountain-building chaos on the western margin of the Plateau. Our continent now had a western Cordillera from Mexico to Alaska. Nevada, California, Oregon, Washington, British Columbia, and Alaska were also added to the continent, late-comers to the party. The Colorado Plateau was not much affected by the rude incursion to the west. However, when the inexorable pressures from the west began to shove the Pacific sea floor under the margin of the continent during the last two minutes, the Cenozoic, then things began to happen in the Lake Powell country. Our area had been a low-lying edge of the continent, now elevated to about 3,000 feet by the shoving of the newly-acquired continental fragments to the west. As slabs of the Pacific sea floor reached the continental margin, the heavy iron-rich black slabs shoved under the continent. The subducting oceanic floor slid beneath the light-weight floating continent like pushing a book under a carpet - the carpet wrinkled. Now a mystery, not yet adequately answered. The Plateau didn't buckle - the Rocky Mountains to the east of the Plateau were thrust up by the underlying pressure of the subducting oceanic plate. The Plateau was merely heaved upward, as though it were too stiff and rigid to wrinkle and crack. Oh, there are some faults and some massive wrinkles, but the Plateau didn't fragment and heave upward like the Rockies to the east. Fortunately, for those of us who love the canyonlands, the lithic layer-cake merely rose intact. The rivers that had coursed over the low-lying Plateau, cut downward at almost the same rate as the land rose, incising deep canyons through the Plateau and the uplifts. All this in the last few moments of our 24-hour clock of deep time. The Grand Canyon formed in the last nine seconds. 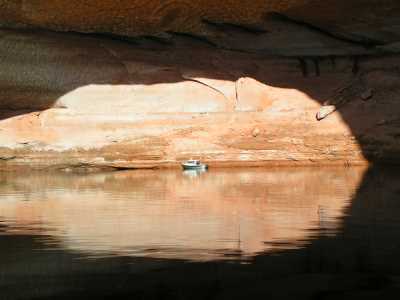 Humans arrived on the Plateau during the last eyeblink of time - to gaze in awe at Glen Canyon, now flooded by Lake Powell. This gem has a very different setting than Lake Powell. Lake Mead snuggles, rather uncomfortably, in the Basin and Range Province, the next geologic region west of the Colorado Plateau. 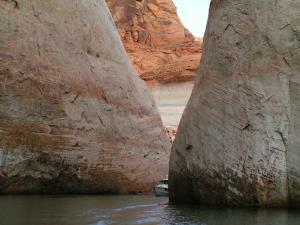 The geologic story of Lake Mead is virtually the same as Lake Powell until the Cenozoic. The Colorado Plateau rose as a block above those subducting oceanic slabs, yielding a high plateau of layer cake geology cut by rivers into canyonlands. The Basin and Range bulged upward into a great swollen hump. The top of the hump stretched more than 100%. The crust was unable to withstand the incredible stretched tension over the bulge, and ruptured into hundreds of deep down-dropped elongate valleys with intervening tilted mountain ranges - basins and ranges. Nevada is essentially a broken, fragmented upside-down bowl. The Colorado River, leaving the Grand Canyon at the Grand Wash Cliffs, had to thread its way through those fragments. Lake Mead now occupies down-dropped blocks between tilted ranges. There's another brief geologic tale to tell of Lake Mead - volcanoes. The rupturing of the bowl yielded fractures that penetrated deep into the sub-crust, tapping magmas below. 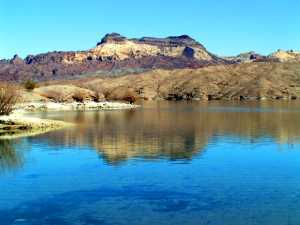 They flooded upward as volcanoes and lava flows, capping many of the mesas that surround Lake Mead. 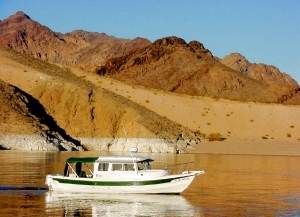 Lake Mohave is a gem within a Basin and Range setting. Its tale involves great periods of erosion that scoured away most of the Paleozoic and Mesozoic rocks so beautifully displayed in the walls of Lakes Powell and Mead. Lake Mohave is the daughter of volcanic blasts. It has been described in another section of our story. If you would like to read a more complete tale of the Basin and Range, you might want to read The Geology of the Great Basin, by Bill Fiero: University of Nevada Press.